I didn't get to do too much treasure hunting this week but I did have some treasure from a few weeks ago tucked away. 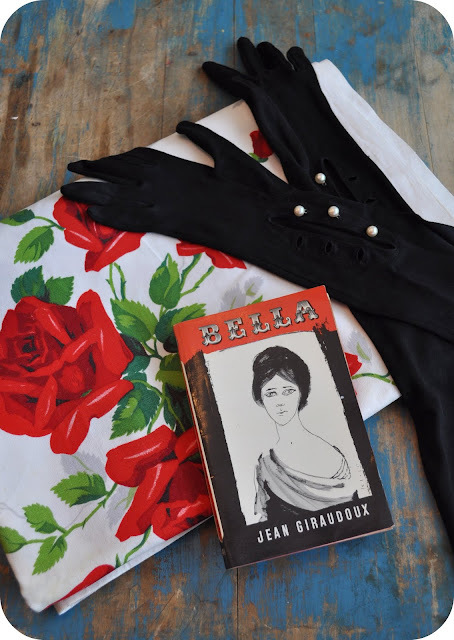 Amanda Dear found this French copy of Bella by Jean Giraudoux in a used bookstore while she was adventuring in France last month. I love the cover, it reminds me of a Modigliani painting. I found this pair of elbow length opera / burlesque dancer gloves at an estate sale a few weeks ago. I wish wish wish they fit me but they are too small (so they will be in the shop soon). I adore their pearl buttons. While at the estate sale, I also found this amazing red rose tablecloth. It is the perfect size for a picnic table and I can't wait to test it out. I also can't wait to use it as a photo backdrop, so pretty. While walking the Bono Baby the other day, I noticed that one of our neighbors was throwing away some treasure. 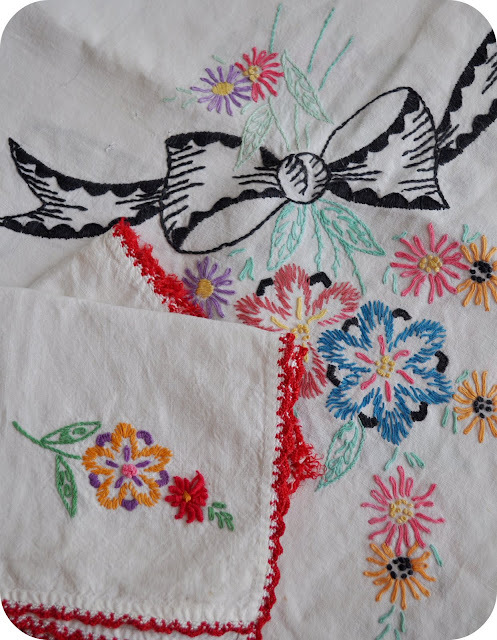 I admit I did a little bit of digging but I found this embroidered tablecloth and napkins with red trim. They aren't in the best shape but I have big plans to use them for a project. The red trim is precious. I can't believe they were just throwing those away! So cute. Can't wait to see what you do with them! ohhh i adore the tablecloth, the red rose has special significance to me so it jumped right out. it will be lovely for picnics. Wow, the gloves are fabulous, I love the tablecloth and how could anyone throw out doilies, even if they aren't perfect any more. That roses tablecloth is SO VIBRANT!! Gorgeous! I am on the hunt for some lovely vintage gloves for a cute little display I want to do in my apartment. Your neighbor was throwing them away? Thank goodness you rescued them! Even if I don't need something, I've been known to rescue tossed out items to donate to the thrift.